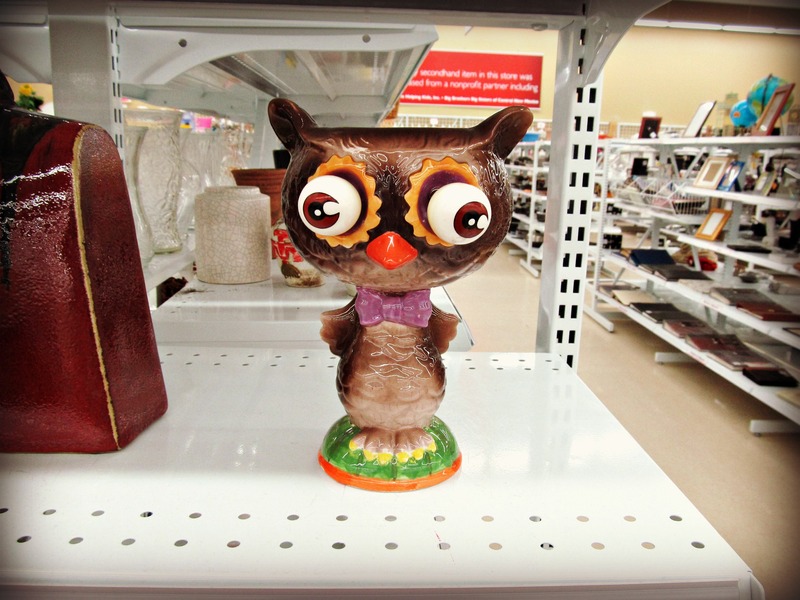 Maybe I should rename this series Thrifting Thursdays-but-sometimes-on-Friday or whenever the heck I can muster enough words strung together to count as a post. Sorry for the absence this week, it’s been kind of a busy work week, which translates into less internet time when I have non-work time on my hands which translates into one random thrifting post at the end of the week. Anywho, to blow off steam I’ve recently been doing more window shopping at nearby thrift stores. Since, I have put myself on buying ban until I can sort through the pile of treasures I already have in my arsenal, I have been a good girl and haven’t added anything to my pile. Yay for me!!! 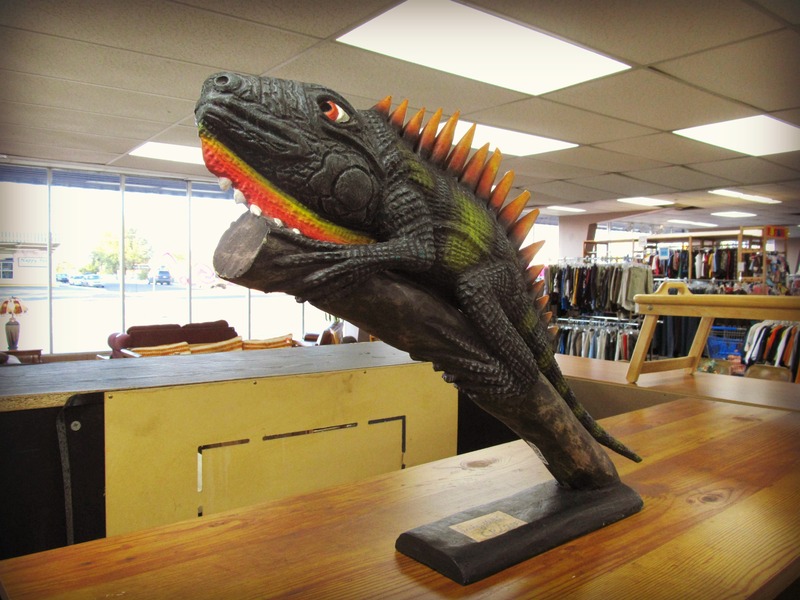 Like this lizard, he was made of wood and signed. He’s not really my style but I was very impressed with the detail put into it. Look at the scales and his horn type things. I used to know what those were called back when I was going to grow up and be a zoologist. 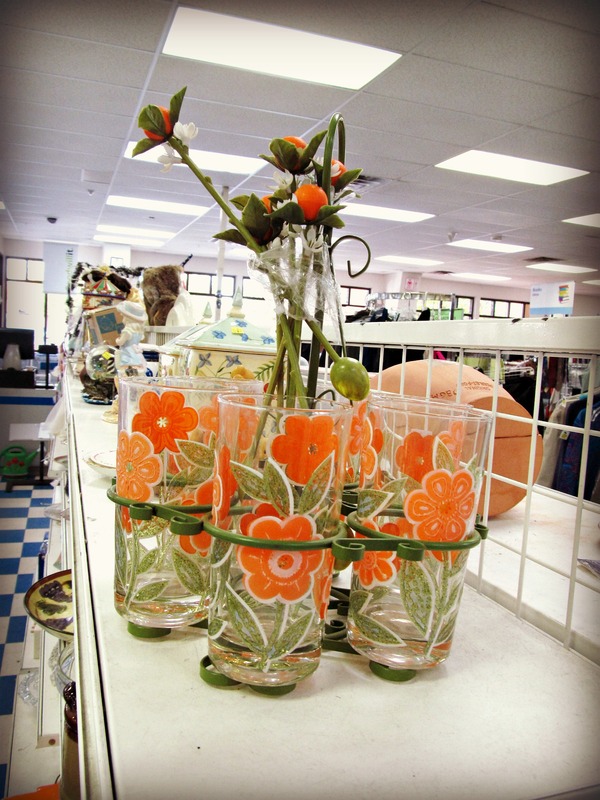 I had to use much strength and will power not to bring this iced tea set home. It even came with matching tea spoons, although the spoons and the rack were plastic, so I can’t be sure of how stable this set would be. If only I didn’t already have a huge pile of breakables in my home. 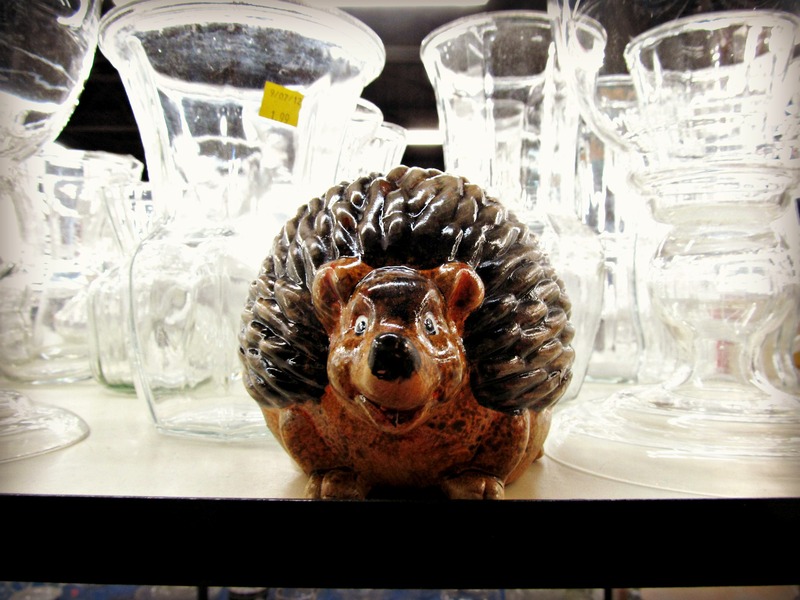 Speaking of breakables, I found this adorable hedgehog, doesn’t he look so happy? I don’t know what I would have done with him, but for some reason I was drawn to his happy face. Then there’s always the owl, this guy was pretty big, and a little scary, but I found him to be picture worthy. Maybe it was his snooty expression. And I can’t forget his teapot friend. Nor their kooky-eyed companion. This guy was really big, probably about 10 inches tall, but again I found him to be picture and blog worthy so here he is. Have you seen anything cooky lately? Or have you put yourself on a buying ban??? 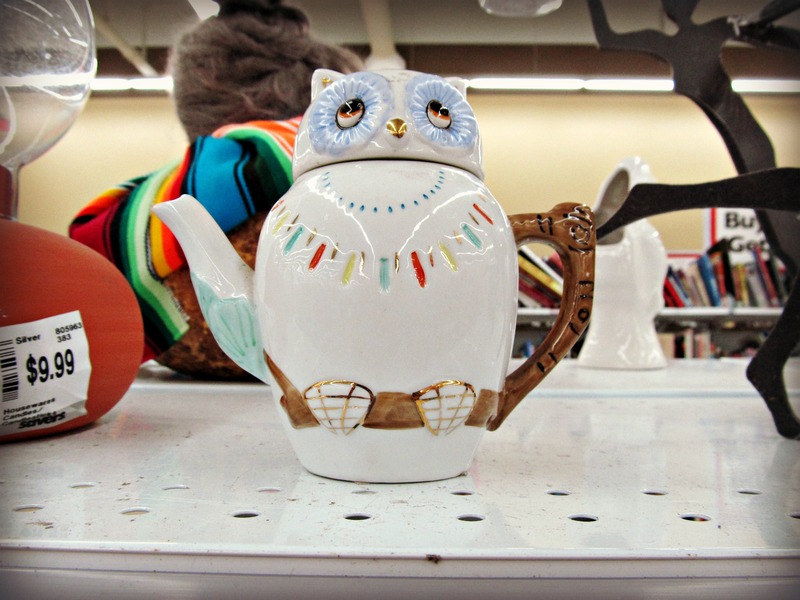 I would have definitely grabbed the owl teapot – so cute! We go thrifting/antiquing a few times a month, currently on a temporary buying ban… though there’s always an exception if we find kitchen chairs… Or bedside tables… Lol and the list goes on. Yeah it was hard to leave the teapot behind, but I thought he deserved to be in a home where he wouldn’t get lost amongst all the other “collectibles”. I totally understand the exceptions, I find that my exceptions list keeps getting longer!! 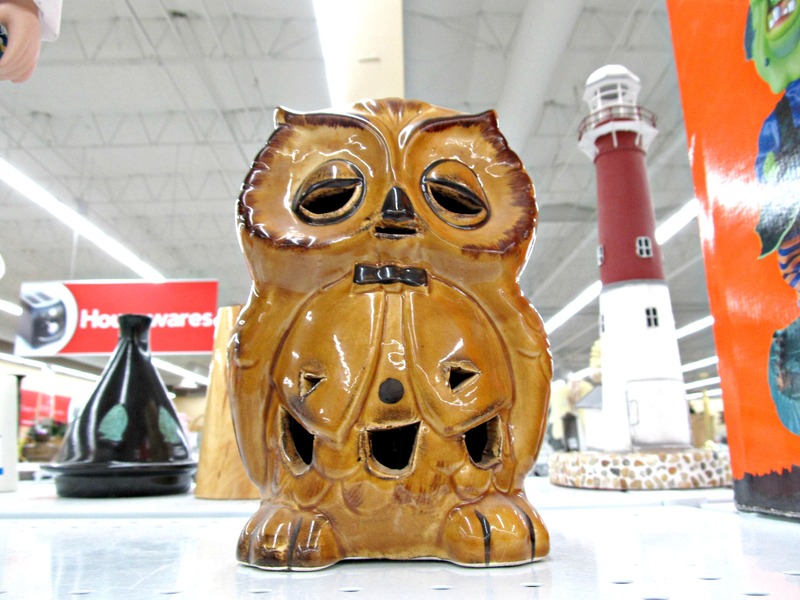 It was a cute teapot, now I regret not making an exception and bringing him home. But that’s ok, maybe someone else will adopt him and he can be happy to be part of someone elses collection. Thanks for reading! !